Planning to go on a vacation this summer? Book your domestic trips via Philippine Airlines Summer Seat Sale! This is an awesome opportunity to travel with less expenses. 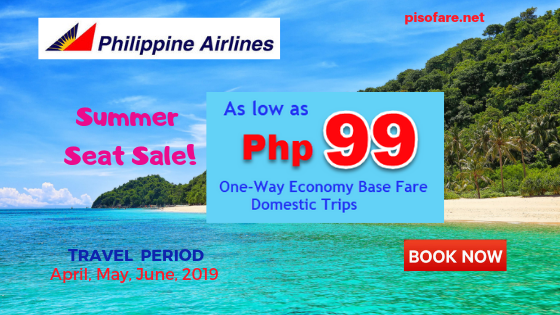 Grab PAL Summer Promo 2019 that start at P99 base fare on Philippine local trips. Beat the summer heat, fly to your desired destination. Fly from Manila, Cebu or Clark to/ from popular destinations in Luzon, Visayas and Mindanao. Quoted PAL sale tickets are good for one-way base fare and exclude taxes/fees, Fuel / Insurance Surcharge and Domestic Passenger Service Charge. Book ticket online at www.philippineairlines.com. Promo Code not needed in booking. Buy PAL sale tickets at the airline ticket and sales offices. Contact PAL Reservation Hotline Numbers. Book via PAL Mobile App. This promo has no child/ senior citizen/ PWD/ military discount. Infant below 2 years fare is 10% of adult ticket rate. PAL promo fare includes 7 kilos hand carried baggage, no free checked baggage allowance. Peak surcharge of P300 applies for flights Manila to/from Luzon and Visayas and P400 Manila to/from Mindanao and P100 for inter-domestic trips for April 22- May 31, 2019 travel dates. Don’t wait too long, book PAL promo tickets ASAP! PAL sale tickets are limited! Watch out for more Philippine Airlines seat sale 2019- 2020 or Cebu Pacific promo fares 2019- 2020 in our Facebook: PISO FARE TICKET!